Taking a cue from seashell art or sailors Valentine art we decide to revamp and re-craft some old frames with mother of pearl buttons and a clay pot with rich pink and red buttons. The pearl buttons create a “beachy” look that is soothing and pretty with a modern twist. The red buttons add a pop of color to a plain clay pot. We used similar buttons for our designs to create a clean and fresh look. We purchased the buttons in bulk from an online auction for just a few dollars. For a wilder look you could use all different colors and shapes of buttons. Look for large tubs of mix buttons at fabric and craft stores. They are generally around $5 for a large tub. If buttons are not your speed you could use broken bits of plates and tiles, coins and keys or store bought mosaic tiles. Small tiles designed for craft projects can be purchased from most craft and fabric stores and are available in a variety of sizes and colors. We used E6000 glue to secure the buttons to the frame/clay pot and an ultrafine grout in a neutral color to create a smooth surface that blended well with the buttons. Re-crafting old frames and clay pots into designer looking decor is as easy as it gets so grab a handful of buttons and create one today. 1. Thoroughly clean your frame/clay pot and allow to dry if water is used. 2. Glue buttons to the base of the frame/clay pot in a random pattern. Use a light application of glue (it shouldn't be thick enough to overflow through the button holes onto the frame); using a bamboo skewer or tooth pick to apply the glue can be helpful. Allow the glue to dry. 2. Mix the grout per the manufacturer's instructions. Wearing rubber gloves and using the edge of a plastic knife, spread grout over the buttons and frame. Work grout in between the buttons and let it set up. 3. Use a damp sponge to wipe away excess grout until the tops of the buttons are clean of grout residue. Set the frame aside to dry. 4. 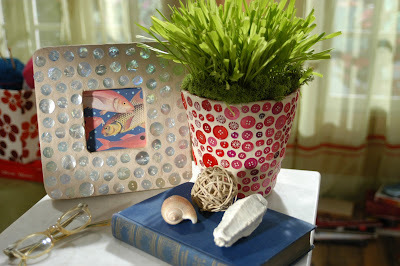 Add acrylic craft paint to the sides of the frame and let dry. Cathie Filian and Steve Piacenza created and co-host Creative Juice on DIY & HGTV. 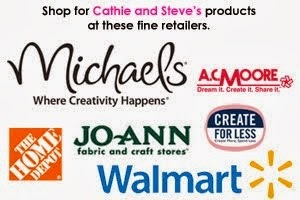 Visit Cathie and Steve at www.cathieandsteve.com. I've always hated anything adorned with buttons, but these projects just goes to show it's all about execution - I love it! Gorgeous. Saw it via Craftzine. I love buttons! and what a fab way to see them all the time! I'm off to buy some grout! actually I might have some in the cupboard, even better! Your button projects are just soooo beautiful - thanks for sharing!